Our extensive research has shown that imitating the smart money can generate significant returns for retail investors, which is why we track nearly 750 active prominent money managers and analyze their quarterly 13F filings. The stocks that are heavily bought by hedge funds historically outperformed the market, though there is no shortage of high profile failures like hedge funds’ recent losses in Facebook. Let’s take a closer look at what the funds we track think about CRH PLC (NYSE:CRH) in this article. Is CRH PLC (NYSE:CRH) a first-rate investment now? The smart money is becoming more confident. The number of bullish hedge fund bets increased by 1 lately. Our calculations also showed that CRH isn’t among the 30 most popular stocks among hedge funds. CRH was in 8 hedge funds’ portfolios at the end of December (its all time high). 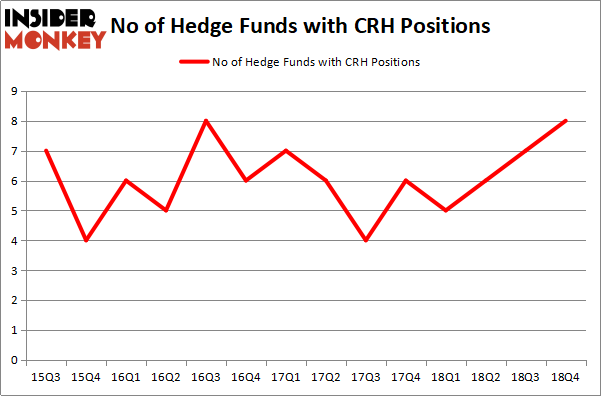 There were 7 hedge funds in our database with CRH holdings at the end of the previous quarter. Let’s analyze the new hedge fund action encompassing CRH PLC (NYSE:CRH). 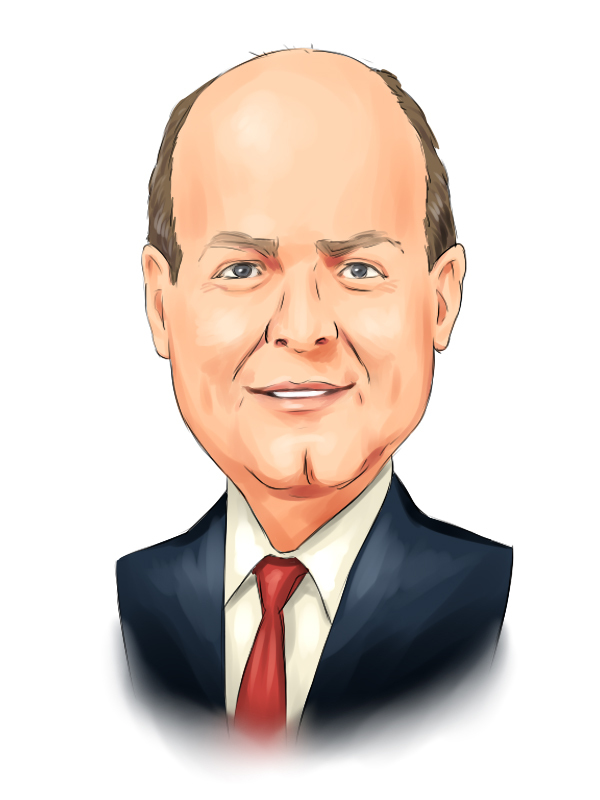 What have hedge funds been doing with CRH PLC (NYSE:CRH)? At the end of the fourth quarter, a total of 8 of the hedge funds tracked by Insider Monkey were long this stock, a change of 14% from the second quarter of 2018. Below, you can check out the change in hedge fund sentiment towards CRH over the last 14 quarters. So, let’s review which hedge funds were among the top holders of the stock and which hedge funds were making big moves. Among these funds, Renaissance Technologies held the most valuable stake in CRH PLC (NYSE:CRH), which was worth $24.4 million at the end of the third quarter. On the second spot was GMT Capital which amassed $18 million worth of shares. Moreover, Arrowstreet Capital, D E Shaw, and Millennium Management were also bullish on CRH PLC (NYSE:CRH), allocating a large percentage of their portfolios to this stock. Now, key money managers were breaking ground themselves. Arrowstreet Capital, managed by Peter Rathjens, Bruce Clarke and John Campbell, initiated the largest position in CRH PLC (NYSE:CRH). Arrowstreet Capital had $3.9 million invested in the company at the end of the quarter. Ken Griffin’s Citadel Investment Group also initiated a $0.3 million position during the quarter. The only other fund with a brand new CRH position is Dmitry Balyasny’s Balyasny Asset Management. Let’s now review hedge fund activity in other stocks similar to CRH PLC (NYSE:CRH). These stocks are Dollar Tree, Inc. (NASDAQ:DLTR), Agilent Technologies Inc. (NYSE:A), Cummins Inc. (NYSE:CMI), and Hilton Worldwide Holdings Inc (NYSE:HLT). This group of stocks’ market caps are similar to CRH’s market cap. As you can see these stocks had an average of 43.75 hedge funds with bullish positions and the average amount invested in these stocks was $2219 million. That figure was $49 million in CRH’s case. Dollar Tree, Inc. (NASDAQ:DLTR) is the most popular stock in this table. On the other hand Cummins Inc. (NYSE:CMI) is the least popular one with only 35 bullish hedge fund positions. Compared to these stocks CRH PLC (NYSE:CRH) is even less popular than CMI but that’s probably because it is a foreign company. Our calculations showed that top 15 most popular stocks among hedge funds returned 19.7% through March 15th and outperformed the S&P 500 ETF (SPY) by 6.6 percentage points. Hedge funds were also right about betting on CRH as the stock returned 22.3% and outperformed the market as well.